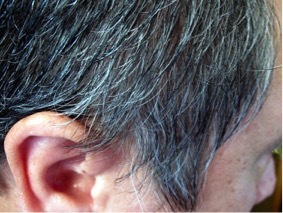 Most of us find our first “grays” by the time we turn 30, usually at the temples, then later, across the scalp. While many people find the salt and pepper look appealing, others go to great lengths to conceal these locks. The gray hair “rule of thumb” is that by the age of 50, half of the population have lost the color in 50% of their hair. When researchers tested this rule, they found that 74% of people aged between 45 and 65 had gray hair, with an average intensity of 27%. Generally, men have more gray hair than women. Asians and Africans have less gray hair than Caucasians. Hair color depends on the presence and ratios of two groups of melanins: eumelanins (brown and black pigments) and pheomelanins (red and yellow pigments). While variations in the ratio of these pigments can produce a large number of colors and tones. Siblings often have strikingly similar hair colour. Hair color varies according to body site, with eyelashes being darkest, because they contain high levels of eumalanin. Scalp hair is usually lighter than pubic hair, which often has a red tinge, due to the presence of more phaeomelanin pigments. A red tinge is also common in underarm and beard hair, even in people with essentially brown hair on their scalp. Hormones such as melanocyte-stimulating hormone can darken light hair, as can high levels of estrogen and progesterone, which are produced in pregnancy. Certain drugs such as those to prevent malaria can lighten hair, while some epilepsy medications can darken it. Genetic factors appear to be important in determining when we turn gray. 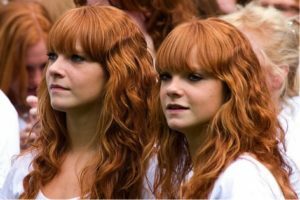 Identical twins seem to go gray at a similar age, rate and pattern, however we’re yet to identify the controlling genes. There is no evidence to link the onset of graying to stress, diet or lifestyle. Certain autoimmune diseases such as vitiligo and alopecia areata can damage pigment cells and induce graying. However, these conditions are uncommon and can explain only a tiny fraction of graying. Early graying occurs in premature ageing syndromes such as Hutchinson’s-progeria and Werner syndrome, where every aspect ageing in the body is accelerated. Premature graying can also be seen in people affected by pernicious anaemia, autoimmune thyroid disease or Down syndrome. Scientists have long known that in order to prevent hair from going gray they would need to either prolong the life of the melanocytes in the hair bulb – by protecting them from injury – or expand the melanocyte stem cell reservoir in the upper or top region of the hair follicle so they continue to replace lost pigment cells. The new agents are being formulated into a product that can be applied as a spray-on serum or shampoo. But they won’t re-colour gray hair or bring back the dead cells that produce hair colour. Instead, they protect your melanocytes.